Opole Voivodeship is one of the 16 Voivodeships of Poland. It can be found in the southern Poland. It is mostly in the historical land Upper Silesia. The capital of the Voivodeship is Opole. 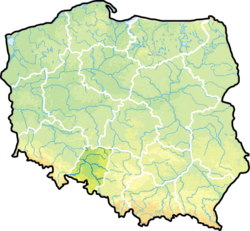 Wikimedia Commons has media related to Opole Voivodeship. This page was last changed on 15 December 2018, at 15:49.